You are currently browsing the Archaeofacts.com archives of Musings for the day Thursday, September 14th, 2017. 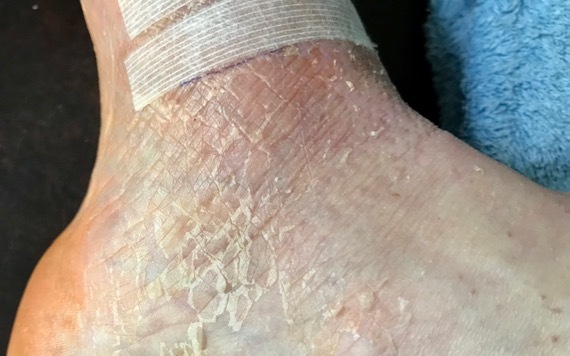 Inside of ankle…no tips from surgical team on skin care…. Today is seven weeks from surgery. Two days ago I began to get my toes prepared to walk again…toes are important to walking/the gait, especially the hallux (aka big toe). My toe awakening is beginning with mostly manual manipulation, and a teensy bit of me actively moving them—teensy because the brain is slow to catch on. I see the surgeon next in two weeks. BTW, the bill for the surgery/followup is already in excess of $30K, almost all of which (so far), insurance is paying. BIG yay for the ACA. Also, millimeter-stones are metric milestones.